Sorghum genome serves as a reference for the highly complex sugarcane genome. Most species are diploids and have two sets of chromosomes, one from each parent. In contrast, many crops have multiple sets of chromosomes (they are “polyploid”) and their complex genomes are more difficult to sequence and assemble, in turn limiting the use of modern, genomic breeding in these crops. For diploid species, sequencing programs generally focus on a genotype with two identical sets of chromosomes to produce a monoploid reference sequence. For the highly polyploid sugarcane, an international team of researchers has successfully assembled a first monoploid reference sequence using a targeted approach that focused on the gene rich part of the genome by harnessing information from a sequenced related species – sorghum. Sugarcane produces 80 percent of the world’s sugar, which is of interest to bioenergy researchers who want to develop sustainable alternative fuels. While more than half of the ethanol produced worldwide comes from the United States, Brazil produces a quarter of the world’s ethanol production from sugarcane. Improving sugarcane breeding methods using molecular biology techniques has been hampered by the crop’s highly polyploid genome, which makes sequencing and assembly of the genome extremely challenging. The reference sequence is useful for mapping the genes involved in sugar production and for identifying different variants on different chromosomes, information that can be used to assemble a more complex and more realistic polyploid sugarcane genome now underway as part of the JGI Community Science Program (CSP), a critical factor in developing sugarcane as a sustainable bioenergy feedstocks. Sugarcane is a cultivated crop that very efficiently converts solar energy into plant biomass, which can then be crushed to extract the sugar-laden juice that can be further purified to produce alternative biofuels. A C4 plant like sorghum and maize, sugarcane can grow on nutrient-poorer soils and does not need to be planted annually. The modern sugarcane cultivars are hybrids, each with more than 100 chromosomes; assembling a sugarcane genome is incredibly complex given its estimated size of 10 billion bases (more than three times the size of the human genome). As part of a proposal by the DOE’s Joint BioEnergy Institute (JBEI), the JGI was part of an international team led by researchers from the French Agricultural Research Centre for International Development (CIRAD), who worked on sequencing and assembling fragments of sugarcane chromosomes into the first monoploid reference of the gene-rich part of the sugarcane genome. Reported in Nature Communications, their approach relied in part on having a sequence for sugarcane’s relative sorghum, a JGI Plant Flagship Genome sequence, and knowing that there was a high level of colinearity between the two crops, which meant most genes in sorghum occurred roughly in the same order in sugarcane. To create this reference sequence, the team relied on bacterial artificial chromosomes (BACs), vectors that can hold large DNA segments such as an entire sugarcane gene and its associated regulatory elements. Sequenced segments of sugarcane-genome-containing BACs were aligned on a sorghum sequence and the overlapping segments used to define a minimum tiling path of sequences in a single contiguous region. The JGI sequenced half of the 4,500 BACs sequenced for this project that were colinear to the gene-rich part of sorghum used as a reference. The final sugarcane sequence generated is 382 Mb; 25,316 protein-coding gene models were predicted with more than 80 percent found to be colinear to comparable regions in sorghum. Based in part on these positive results, in 2017, JGI approved a CSP proposal from the international team to complete the first draft genome sequence of the polyploid sugarcane variety R570. Among the numerous benefits expected from a genome sequence are better understanding the roles of genes in traits such as sucrose accumulation and disease, as well as targeting genes to improve biomass and sugar yield for biofuel production. This work was supported by the International Consortium for Sugarcane Biotechnology, as well as the South Green Bioinformatics platform (http://southgreen.cirad.fr). 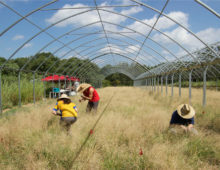 For the portion of the work conducted by the Joint Genome Institute and the Joint BioEnergy Institute, support was provided by the Office of Science of the U.S. Department of Energy under Contract No. DE-AC02-05CH11231. Garsmeur O et al. A mosaic monoploid reference sequence for the highly complex genome of sugarcane. Nat Commun. 2018 Jul 6;9(1):2638. doi: 10.1038/s41467-018-05051-5.